2004-2006 Tourism Definitives. 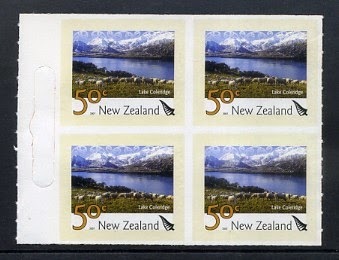 2009-2010 Scenic Definitives. 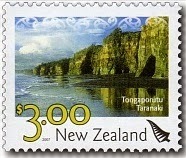 In 2007 New Zealand issued another set of Scenic Definitives. This time there were seven gummed stamps with two designs repeated as adhesive stamps for coils and booklets. 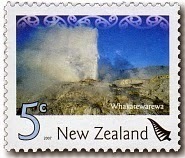 These stamps are still current at the time this post was created (March 2015). New Zealand is known as one of the most beautiful countries in the world, and each year thousands of visitors make their journey here to enjoy our unique natural environment. As Kiwis, we’re lucky to have such a wonderful environment at our doorstep. 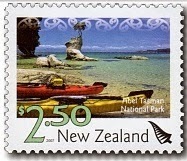 This stamp issue is about recognising our unique scenery, protecting it and promoting it overseas. Set in a landscape of geothermal activity lies Whakarewarewa, a traditional M-aori village that has occupied the area for more than 200 years. Famed for its hot thermal springs and bubbling mud pools, Whakarewarewa boasts the largest geyser in New Zealand, Pohutu Geyser. The name Whakarewarewa is an abbreviation of Whakarewarewatanga O Te Ope A Waihiao, which means ‘the uprising of the war party at Waihiao’, referring to a war party performing a war dance by the geysers before going into action. This must be the most famous thermal area in Rotorua. If you only have the chance to see one then this should be it. As well the usual thermal attractions, Wakarewarewa has much more to offer. There is the Maori village and meeting house where concerts are performed. There is the institute of Maori Craft where its interesting watching cavers at work. Of course, don't forget the kiwi house too. Central Otago, the most inland region of New Zealand, is a place like no other. It is the driest, hottest and coldest place in the country and has a powerful landscape of contrasts – rugged terrain, tussock grasslands, fast rivers and mountains that go back millions of years. In the 19th century, Central Otago was the scene of a gold-rush – its old stone cottages and mining remains are still visible today. Nowadays, the region is renowned for its wineries, particularly its deep rich red, Pinot Noir. That tree, completely covered in snow like that, makes a great photo. At first glance, it almost looks like some kind of explosion, until you realise it a snow covered scene. There must have been almost no wind or else much of it would have been blown off. 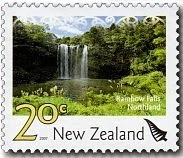 Rainbow Falls is one of Northland’s most spectacular sites. Based in the Kerikeri basin, this magnificent 27-metre waterfall is surrounded by native bush and birdlife, and can easily be accessed from the Kerikeri River track. When ever I show people around the Bay of Islands I make this one of the highlights of my tour. Its Maori name is Waianiwaniwa, which means ‘waters of the rainbow’, referring to the brilliant rainbow colours produced by spray lifting as the water falls down the cliff face from the rocky ledge above. Lake Coleridge is one of Canterbury’s most popular lakes, enticing visitors from near and far. Set in the eastern foothills of the Southern Alps, Lake Coleridge is a natural paradise – with glacial blue water, breathtaking scenery and abundant marine life. Located near the Raikaia River, Lake Coleridge is the site of New Zealand’s first hydroelectric power scheme, which was completed in 1914 and continues to run today. 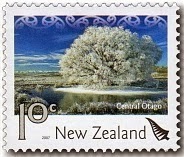 This stamp scene was also used in an adhesive format for the booklet seen below. In this case the stamps have not been perforated which would make them very difficult to separate. 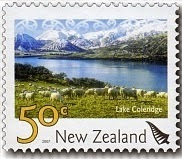 2007 50c Lake Coleridge Booklet, complete imperf. Below is another example of this same error. Rangitoto Island, at 700 years old, is the most recent and largest of Auckland’s volcanoes. With a summit of 260 metres, Rangitoto Island is a prominent landmark that can be seen from many parts of Auckland and has often been reproduced by artists and photographers alike. With stunning views of the harbour and city, fantastic birdlife, a variety of walks and an archaeological wonderland, Rangitoto Island is a popular spot for daytrips, and can be reached by taking an easy ferry ride from Auckland city. Judging by the number of pleasure-craft in the foreground, the photo appears to have been taken from Orakei Marina. The walk to the summit is steep in places, over a gravel track, so good walking shoes/boots are necessary. It can be hot, with the sun reflected of the volcanic rock and lava, so a sun hat, sun block and cold drinks will be required. Upon reaching the summit, make sure you have camera and binoculars too. $2.50 - Able Tasman, National Park. With golden sand and turquoise waters surrounded by lush, green forests, Abel Tasman National Park is one of the most beautiful – and popular – national parks in New Zealand. All year round, Kiwis and international visitors flock to this piece of paradise to enjoy its natural wonders, be it on land, on water or in the sky. Named after the first European discoverer of New Zealand, Abel Tasman National Park enjoys some of the best weather in the country, with a steady climate and near-perfect water conditions. The Tongaporutu area, north of New Plymouth, is one of the country’s best-kept secrets. With a spectacular coastline consisting of ancient caves, sheer cliff faces and an iron-sand beach, Tongaporutu is a changing canvas that dates back to the 1300s when the waka, Tokomaru, came ashore. At high tide, the coast can be a treacherous place as waves crash into the cliffs; at low tide, historic rock carvings become visible in the ancient caves. 50c - Lake Coleridge. 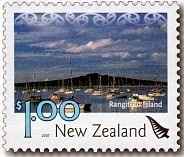 $1.00 - Rangitoto Island. Self-Adhesive for coils and booklets. Three Used First Day Covers. 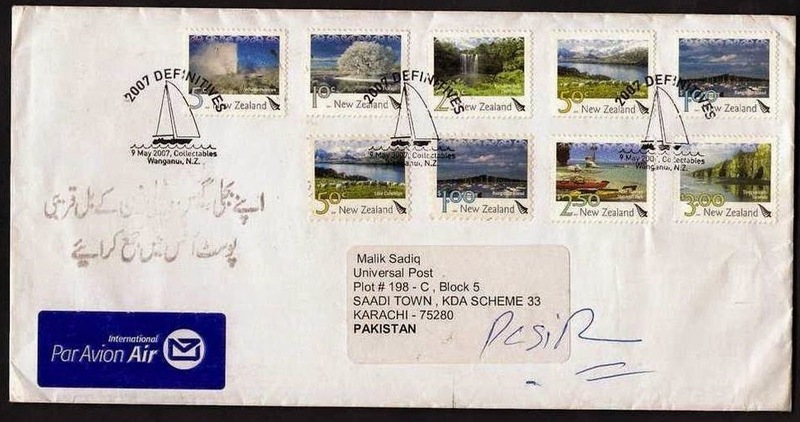 These three First Day covers were sent from the NZ Post Collectibles Centre in Wanganui, to stamp collectors in India and Pakistan. 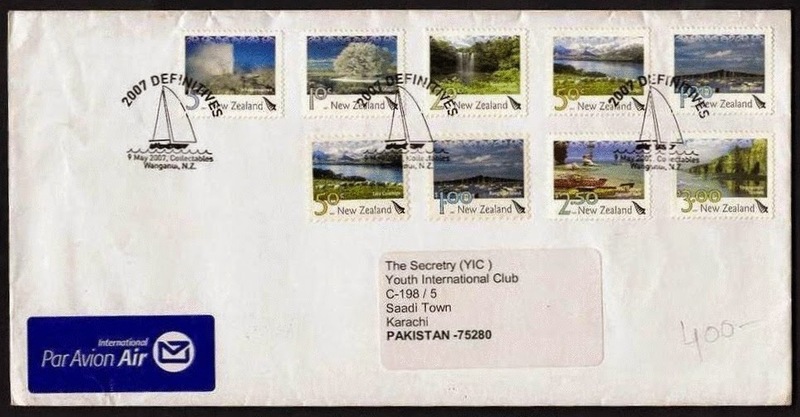 The stamps, including the two adhesive ones, are neatly laid out and cancelled with a 9th May, 2007 date stamp. The address are added on printed labels and an airmail sticker is added. Yes I acknowledge they were sent by NZ Post but there are two things which I like about these covers. First they carry real addresses and appear to have been sent through the post. Secondly they have interesting destinations. Those are amazing FDCs. 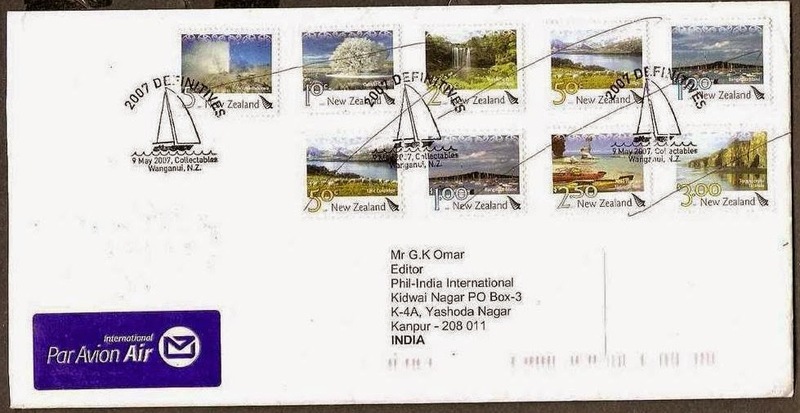 To get all the stamps for an issue like this on a cover sent overseas is something special. To get a cover sent from this land to my home country is even better. I, myself, am in agreement with you about a cover is better with a used appearance.